First things first. I was delighted and honoured to be re-elected as one of your three Latchmere councillors at the Wandsworth Borough Election of May 3rd, along with my fellow Labour colleagues, Simon Hogg and Kate Stock – they are the kids in this picture of the three of us! Immediately after the election councillors, are faced with seemingly endless inductions into being a councillor, the latest and most interesting one being the induction to our role as Corporate Parents, held on 30th You may well ask what that means and, as it is such a new role (under 10 years), I am not clear that there is an absolute definition. However, the Government decided that, in default of their own “positive” parents, children in Council care should be able to look to the Council, and councillors, as Corporate Parents. I have my doubts about this role. I have little doubt that in some ways, and in individual cases it works. Some councillors devote considerable time and effort to supporting so-called looked after children, many of whom appreciate it very gratefully. However, it is impossible to imagine MPs imposing a similar role on themselves for at least four reasons. First of all, they are not trained social workers and nor are we. Secondly, they would claim to be too busy – so what makes them different from councillors? After all many councillors already do a full-time job. Thirdly, it implies that we, councillors, are all part of one big happy family working as a team, when, clearly, we have very strong political differences about issues such as funding and housing, which have massive implications for so-called looked after children. Fourthly, it purports to give councillors a moral and legal responsibility, which they are in no way able to implement and which I doubt could ever be maintained in court. Actually, it is in danger of being a sham, another way of passing on the responsibilities of a state, not prepared to fund public services with decently higher levels of taxation. Of course, MPs would never think of imposing such an impossible burden on themselves: they are after all, a breed apart! On the 10th May, I spoke at David Lewis’s funeral in St. Mary’s, Battersea. David was the Battersea Society’s foremost planning expert and he and I, as Labour’s lead on planning in the Council, had many interests in common. I first met him at secondary school in the fifties and I have lived near him in Battersea since the sixties. David lived his civic values. He was the most assiduous and industrious local champion of the environment both here and in North Wales. One early campaign of his (and his wife’s, Christine), I recall was to “save” Albert Bridge from possible demolition and replacement with a larger and stronger new bridge, capable no doubt of taking a motorway load of traffic up Albert Bridge Road. It’s a pleasure to say he won that campaign and that I played a very small part in that winning campaign! David, RIP. Two days later, another old friend invited me and my partner for a day’s outing on the Bluebell Line from East Grinstead to Sheffield Park. I had never been there despite knowing Sussex pretty well. The steam train runs 12 miles through bluebell woods, which though perhaps a week past their best on 12th May were still spectacular. The line was constructed following the 1877 Act of Parliament and was “finally” closed after legal and parliamentary disputes in 1958. The Bluebell Railway Preservation Society was founded in 1959 and has been running the service ever since. Sheffield Park, at one end of the line is a country house and Arboretum – unfortunately it rained on 12th May but it was still an enjoyable trip. You may remember that last month I wrote about “the world premier of Winstanley Stories, a film made by Falconbrook Primary School’s pupils”. Well on 13th May I talked about the film and the making of it to a small group organised by “Sound Minds” at the Battersea Mission Sound Minds had an art photographer, who took this from outside the building and through the window! It was very enjoyable, with active participation form some of the younger members of the audience but I wish more people had been able to be there. Once again may I recommend that you have a look at this film about the Winstanley and York Road estates on YouTube http://www.winstanleystories.org.uk/film.html. On the 16th May we had the Annual Council Meeting, when the Mayor for the coming year is elected and also the Leader of the Council and membership of the Council’s various committees. The Mayor is Councillor Piers McCausland, not in my view a brilliant choice. That may not be a very politic thing to say but his, shall we say, eccentricity makes him an idiosyncratic selection by the majority Tory councillors. My friend and colleague, Simon Hogg, was re-elected Leader of the Labour councillors. Simon is NOT a pushy, boastful type of leader. He works hard encouraging all 26 of us councillors to take up very active roles. He operates in a quiet, restrained fashion, which gets some criticism but which, I think, gets increasingly appreciated over time. On 22nd May fellow councillor, Leonie Cooper, and also Greater London Council member held a reception at City Hall. It was good to have a chat with various new and old friends from all over London, and be reminded of the view from City Hall’s front door! The May meeting of the Planning Applications Committee was on the 24th, but, once again, there was little of note, at least, for Battersea. BUT several of you have asked me what is happening as regards the tower block “threatened” for the pocket site at the corner of Battersea Park Road and Culvert Road. Like some of you, I had noticed that all construction activity had stopped there. And, like you, I had hoped that some wiser heads just might have prevailed. So I made enquiries. However, the planning officer tells me that there is a requirement to sign a deed of covenant, which must be done by 23rd July and one party to the deal has not yet signed up. The contractual haggling that may or may not be happening behind the scenes is not a planning matter, even though you might think it should be. Hence all I can say is that there are, presumably, some kind of contractual negotiations going on behind the scenes, which could go on for another 7 weeks before preventing the current approved application from proceeding. Let’s hope that this over-development gets stopped by current market conditions! When I got back from David Lewis’s funeral, see para 5 above, I received an email telling me that one of my biggest college buddies had died that day. I attended Tony Renton’s funeral on 31st Apart from spending 3 years at college with Tony, I also shared my first two flats in London with him and a couple of others. He was a brilliant polemicist and a fantasist, a gambler, not with money perhaps but with life, which he certainly lived extravagantly and to the full. Pity about the waist-line though (, but who am I to talk?) – he used to be so thin but the twinkle in the eye and the extrovert personality are still there. Tony, RIP. Meanwhile, I did have some housekeeping to do. For my pains, I have had to finalise and get signed off all the statutorily required election expenses for all 21 of the Battersea Labour candidates at the election. That amounted to over 1,000 sheets of 16 statutory forms, many of them identical for candidate 1 to 21, all of which will probably disappear into a town hall vault, never to be seen again! And finally, I tried to maintain my sanity by, with my partner, completely revamping our back-garden – and that has been good. On Saturday, 2nd June, I hope first to go to the Share Community’s Garden Centre, in the grounds of Springfield Hospital, both to buy plants for my garden but also to support the Share Community’s work on behalf of disabled people. And later I plan to go to York Gardens for the summer event there. On Sunday morning, 3rd June, I will be off to the National Gallery to see the Monet exhibition, which I expect to be a beautiful display of French Impressionist art. On 4th June at 6.30 I will be in Christ Church, on the corner of Candahar, Cabul and Battersea Park Roads, to hear an oral history of War Comes Home. This will be presented by Carol Rahn of the Battersea Society and will include the reminiscences of Battersea residents, who lived here during the Blitz. All are welcome – do go. Did you know that we have a Deliveroo processing centre here in Battersea? I must say that I didn’t. But councillors have been invited to visit and I am going on Tuesday, 5th June. I certainly want to question them on their employment practises and their safety records. The National Opera School in Wandsworth High Street is giving a free lunch-time concert on 6th June and I certainly hope to be there. On 8th June I am going to Wilton’s music hall to see Sancho: An Act of Remembrance – a play about an eighteenth-century African, who campaigned against the slave trade. If you have never been to Wilton’s, which is close by Tower Bridge, then you ought. It is a recently restored nineteenth-century music hall – very atmospheric! On 9th and 23rd June I have councillor’s surgery at Battersea Central Library. The North East Surrey Crematorium Board meets on 12th June and after 40+ years as a councillor, I get to go to my first ever meeting of it – the Crem as it is called – the whole of human life, as they say! I have a Community Services Committee on the 21st June and the Planning Applications Committee on the 26th. Finally, on 30th June, we have the Falcon Road Festival, which I expect to be great fun. Last month I asked, “Who was Chesterton? And what was he to Battersea or Battersea to him? And what else in Battersea is named after him? I was surprised that not one of you responded. It was pretty easy so Why? Has the format got stale? Should I do something else instead? Who votes to retain Do you Know? Meanwhile G. K. Chesterton or Gilbert Keith Chesterton (1874-1936) was a prolific author of novels and detective stories, whose fame has declined a lot since the early twentieth century. Possibly because he was really an essayist, a commentator, an eccentric wit. Chesterton lived in 60 Overstrand Mansions, Prince of Wales Drive and in one amusing essay he compared a flooded North Battersea to “a vision of Venice”. If he had lived a century later he would probably have been a TV journalist, or a Newsnight presenter. My partner has written a brief essay on him in the Battersea Society’s “Battersea Matters”. I would be happy to copy to anyone interested. Of course, Chesterton Primary School is named after him as indeed is Chesterton Close, just behind Wandsworth Police Station, Chesterton House in the York Road estate and the Old Chesterton Building in Battersea Park Road. March, What a month – for anyone really interested in politics, then drama of the highest order, even when, as often, the procedural details were really boring. And for anyone not interested then just boring. But more of that later! Meanwhile my month started off very low key. As I said last month, I was due to play chess for Surrey on 1st March. I went all the way across town to play at Wanstead, where I registered my first win for the county! But only because my opponent didn’t turn up! What was worse Surrey got hammered, although I won my point! My first Council event of note was a visit on March 5th to the Tideway Tunnel works next to the York Gardens Library. In one sense I was disappointed as I had expected to dive down underground and go for a walk along a 12-metre high sewage tunnel with my guides; but we didn’t do anything as exciting as that. So, you can imagine how jealous I was to see that the Mayor and Mayoress did get down into the tunnel, as shown in next picture! Nonetheless it was fascinating. I must admit that I hadn’t quite realised what the future role of this 12-mile tunnel is going to be. I had thought that it was going to be a new major sewer simply taking flood waters to London’s major sewerage processing centre at Becton Treatment Station, Barking. But the plan is to use the tunnel as a massive holding lock. When London is hit by storms and heavy rain, the flood of water, clean and/or soiled, becomes too great for Becton to handle. The tunnel will hold this water and release it, as capacity at Becton allows – a massive underwater dam and overflow tank. The principal benefit of the project is that it will eliminate most of the (on average) bi-annual floods of sewerage water into the Thames, which currently result in the death of some 2 million fish, and no doubt some cormorants and other wild life dependent upon the health of the river and its fish. The Tideway Tunnel company is also involved with the local community in other ways. For example, the Tunnel employs 247 Wandsworth Borough residents on the project and two apprentices. The staff are also helping Falconbrook School with educational projects and indeed the mural around the site, pictured here, was done by Falconbrook pupils. I think that the Council Meeting on 6th March should have been about Brexit and the possibility of a People’s Vote. It would have been highly topical as Britain was, after all, timetabled to leave the EU on 29th March. But Labour’s motion to Council bundled up the People’s Vote with other important issues, such as the Government’s cuts in police funding and the roll-out of universal credit: the result, I am afraid, was a muddled debate without focus or much purpose. Now I know that at least one reader thinks that I should stop bleating on about Brexit, but it is important to lots of Wandsworth residents, many thousands of whom are from the European 27 countries and are very concerned about their position here. Moreover 23,997 people from Battersea have signed the petition calling for a People’s Vote. The comparable figures for Putney and Tooting are 19,938 and 22,350 respectively, so no apologies! So, on 23rd March I was on the People’s Vote one million strong march. Here I am with some friends in Trafalgar Square and a critical representation of the PM. Some of you will have been there too. After all, simple arithmetic suggests that there must have been about 2,000 Battersea residents there. Then by 29th March, we had had all the “indicative votes” and Brexit did not happen! Now, I know that many are highly critical of our politicians and the mess that they appear to have made of the whole thing, but let me put another point of view. They have demonstrated what we all know: both the country and its elected representatives are divided as near to down the middle as makes no difference. And what the MPs are likely to achieve, in my view, is a choice between the best Brexit that can be offered or continuing as a full member. A good outcome from this Parliamentary maze would be to present us this choice in a confirmatory referendum. Let’s see if I am right. On the 9th March, Penny and I went to Earlsfield’s Tara Arts Theatre to see The Importance of Being Earnest. I can see you thinking that it must have been a conventional rendering of this great Oscar Wilde play. But you would be wrong. You can see from the picture that this is not a conventional theatre – nor was the play’s production. The entire drama and all the parts were acted by two young women (here they are eating cucumber sandwiches) – so unlike any conventional production. And it was brilliant. Battersea is an appropriate venue for such a presentation for it was right here, in 1829, in what is now Battersea Park and was then river marshes that the Duke of Wellington, hero of Waterloo, conqueror of Napoleon, fought a duel with the Earl of Winchelsea. It was one of the last of its kind fought in the UK, the last being between two Frenchmen in 1852. It would have been fun to have said that the duel was over a woman or gambling debts, but NO it was about politics! At least we don’t act so rashly now. At the 27th March Planning Applications Committee we had 23 planning applications, none of which were of spectacular consequence. Only two related to Latchmere. 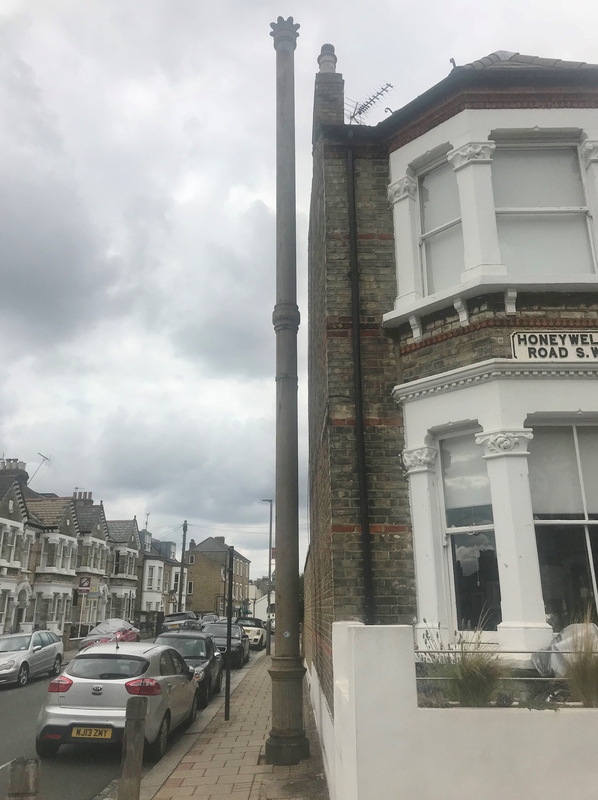 One was an application for two houses behind the listed buildings next to the mosque in Falcon Road and the other to remove an unneighbourly fence between houses in Brynmaer Road. One other application was also nearby. It was for the demolition of the William Hill bookie’s at the base of Park South and for its replacement by a ground floor commercial unit with nine new flats above. Some of you may recall that thirty or forty years ago, it was one of the largest public conveniences in Britain! On 28th March, I joined the newly formed Friends of Christchurch Gardens group in an initial meeting with Enable, the so-called charity group that now operates Wandsworth’s Parks and Commons. The Gardens are in need of some neighbourly care and it is great to see that local residents are getting together to do just that. If any reader wants to get involved, then I will happily put you in touch with the “Friends”. Finally, on the last day of the month one Wandsworth Tooting school featured in the press (e.g. the front page of The Observer) because members of staff are prepared to take a £7,000 salary cut in order to save the jobs of others, who faced being dismissed because of Government funding cuts. The education cuts in North Battersea are extensive. They include: Harris Academy £1.6 million or £769 per pupil (pp); Chesterton £343,966 or pp £519; Falconbrook £292,702 or pp £412; Sacred Heart £205,575 or pp £286; John Archer Primary/Highview £199,311 or pp £170; Christchurch £75,439 or pp £250. How these cuts will affect individual schools depends on the decisions of individual heads and governors. However, after 10 years of austerity, it cannot be but that the education of the next generation must suffer to a degree. On 1st-3rd April, I am off on a round trip to Essex and York visiting relatives celebrating their 79th and 100th birthdays. I don’t suppose that there will be much dancing or knees-ups; but it will be good to catch up with family members. On 16th April I am going to fulfil one of many schoolboy dreams. I guess that I will never score a hat-trick at Wembley but I will be visiting the main rail signalling centre for all Waterloo lines. I don’t suppose that it is still like the old films with massive levers pulling the old semaphore signals up and down but it should nevertheless be fun – and interesting! The Planning Applications Committee is on 25th April. Last month, I asked whether anyone knew anything about Joan Bartlett or Doris Emmerton. I got informative and interesting answers. So, thanks to Michele, who tells me that Dame Joan Bartlett (1911–2002) was a founder of Servite Secular Institute. As Joan Bartlett, she opened a residential home for the elderly homeless, having been inspired by hearing the late Violet Markham speak at Caxton Hall about the plight of many elderly people who had been bombed out during the Blitz. The Servite Order lent her £8,000, and with this and other contributions she purchased a property for the home in The Boltons, London, which was later registered as a Housing Association, which became known first as Servite Housing and now as Viridian. And thanks to Kathleen, who wrote to say that Doris Emmerton was the Head of Joseph Tritton Primary School in the 1970s, just about when Doris Emmerton Court was being built and just before the school was closed, demolished and replaced by housing. I also asked what are Battersea’s two connections with J M Turner, the great artist? Well, first thank you for pointing out that in an early version I had mis-typed Mallord as Mallard – I claim it was the spellchecker! And yes, he lived on the Chelsea bank of the river and often crossed to paint river views from St. Mary’s church and that there is a chair there known as Turner’s Chair. And as one of you pointed out to me, the actor Timothy Spall, who played Turner so brilliantly in Mike Leigh’s 2014 film, Mr. Turner, is a Battersea boy. You might also, if you had long memories, have said that I used this one of Turner’s watercolours in a 2017 edition of my newsletter! On the night of 28th/29th March Samantha Heath tragically lost her fight against cancer. Many of you will not have m et Samantha, who was a Latchmere councillor between 1994-2002. She was also a Greater London Assembly member between 2000 and 2008. Here she is with fellow candidate Maurice Johnson and me on an election leaflet from early 1998. All, who were lucky enough to have met her, will know of Samantha’s infectious enthusiasm. As a fellow councillor, I can also vouch for the passion and learning that she brought to her role as a councillor. She was always engaged and engaging, always elegant, always dynamic. As well as her elected posts, Samantha was a leading light in SERA, which was in effect the Labour Party’s environmental study group. She played a major part in making us all aware of the problems we have with air pollution and especially with diesel pollution. Her legacy will be the advance of environmental protection for London. She would have been delighted to know that ULEZ (the Ultra Low Emission Zone) was being introduced on April 8th. Samantha, RIP. February started very sombrely with Jim McKinney’s funeral. Jim was the vicar at Holy Trinity Church, Roehampton, and also the husband of my fellow Councillor Sue McKinney. Jim was a much-loved partner in this very, warm cheerful couple. His church, a very large one built when Roehampton was a very, quiet rural village, was absolutely packed with a congregation of some 800 people. I don’t think that I had ever before been to a vicar’s funeral: the bishop was there and maybe another 30 of the local clergy, and a very large cross-section of the Putney/Roehampton community. It was a moving event. The Council Meeting on 6th February set the scene for this month’s decision on Council Tax. The decision on Council Tax is actually a long-winded process putting together the current year’s accounts and therefore the current balances, with the plans from all the various committees, the amount of grants received from central government and the demands made upon the Council by Transport for London and the Metropolitan Police all combined with what current legislation allows Councils to do! It hardly makes for an exciting Council meeting! As I have said before, we really need to re-think the civic function of Council meetings. This atrophy must be bad for democracy! On 7th February, members of the Planning Applications Committee visited Battersea Power Station and toured the building. It is difficult not to be impressed by the scale of the development or indeed the views over the London skyline, but it still feels a long way from completion. The Power Station company has reduced the percentage of affordable housing that was planned; I have hopes, however, that the level of affordable housing will be restored. I met the Chief Executive and he certainly stated that was an objective that he wished to achieve! I hope that I am not being gullible, when I say that I believe him, let’s see. On 7th February, I was happy to help Battersea M.P., Marsha de Cordova, host an event at the House of Commons for some of her new constituents and new Labour Party members. I know Marsha would be delighted to welcome you and/or your neighbours to the House – you don’t need to be a member of any political party, so please do let me know if you are interested. Earlier that day, I was calling on a constituent in Rowditch Lane and stopped to photograph these six new council houses. They are to be used to re-house tenants from the blocks on the Winstanley/York Road estate, which are due for demolition and reconstruction. The new houses are a welcome change from the semi-derelict, unused garages that were there before. You quite possibly know that Hillary Clinton got far more votes in the 2016 Presidential Election than Donald Trump but still, obviously, lost – actually 2,600,000 more votes. In fact, 2 American Presidential elections out of 5 this century were won by the less popular candidate – on both occasions Republicans; Trump in 2016 and George Bush in 2000. But did you also know that on two occasions since the Second World War the party that won most votes in British General Elections also lost the election? In February, 1974, the Tories won just a few more votes than Labour but very narrowly lost the election. In 1951, Labour won 4.5% more votes but got 7 fewer MPs than the Tories. How does this happen? It happens in both the British and American systems when individual constituencies are of unequal size or characteristics. You may well wonder what that’s got to do with Battersea or Wandsworth. Well twice in Wandsworth’s history, in 1986 and in 2018, Labour won more votes but got fewer councillors than the Tories. Fortunately, unlike the States, where the locally dominant party decides on constituency boundaries, we have an independent group appointed by Parliament called the Boundary Commissioners. So possibly the most important preparation Labour can take for the 2022 Borough Election is to put the best possible case to the Boundary Commissioners for ward boundary re-distribution – and that is what we are trying to do now! I am involved in a series of meetings, 3 last month, surrounded by maps and spreadsheets – great fun for nerds! The Tories, and Lib Dems and anyone else interested, are doing the same. All trying to put together the most convincing arguments they can find for the version of the boundaries that they prefer, whilst at the same time ensuring that the resulting constituencies are of approximately equal size. N.B at this stage we are considering Ward and not Parliamentary constituency boundaries. This just may be the last time I write this newsletter when we are all fully-fledged members of the EU community. No doubt we all have slightly different views on this matter but for my part, I think that we are about to inflict the greatest act of self-harm on ourselves perpetrated by any European nation, since … Since when? Well perhaps the civil wars of the old Yugoslavian states, or GB and France’s attack on Suez in 1956. The fact that it is being largely led by the Conservative and Unionist Party is itself ironic as just one of the end results could be the end of the United Kingdom as we know it, if not immediately then within a decade or so. I hope Brexit still may be averted. On 1st March, I am playing chess for Surrey against Essex! Never thought six months ago, that I would be doing that. Mustn’t leave you with the wrong impression though – it’s at quite a low-level grading! On 5th March, I am visiting the Tideway Tunnel works in York Gardens. I think I am going down into the Tunnel along which much of London’s sewage will be flowing in a few years time. On 6th March, we have the Council Meeting, where there will be a critical debate on GB’s role in Europe. There will be a couple of further meetings about the electoral ward boundaries. On Thursday, 21st March, I will attend the Battersea Society AGM in St. Mary’s Church, where my partner, Prof Penny Corfield, will be giving an historical talk on the history of duelling. Several duels took place here in Battersea, including one notoriously involving the Prime Minister of the day! On 23rd March I will be on the big March campaigning for the UK to stay in the European Union. With luck we may still Remain. The Planning Applications Committee is on 27th March. At 11 pm on 29th March we are scheduled to be leaving the EU. I will be at a celebratory party, if we decide to stay, or a wake if we actually leave. Last month, I asked whether anyone knew anything about the women commemorated in these names: Gladys Dimson Hall, the Yvonne Carr Centre, Joan Bartlett House, (Caroline) Ganley Court, (Nora) Clark-Lawrence Court, and Doris Emmerton Court. But not one person responded – where are all the feminists? Perhaps we are all exhausted with a year of celebrating the centenary of female suffrage. I know plenty about Dimson, Carr, Ganley and Clark-Lawrence but not Bartlett nor Emmerton. I would be genuinely interested if anyone does know about them. Meanwhile, here is a question about a man who was connected with Battersea two hundred years ago. He was J Mallord Turner, the great artist. What are Battersea’s two connections with him? 1. Well, the contrast between political life in Wandsworth and in Westminster could hardly be greater and starker than it is now; dead as a Dodo right here and total mayhem in Parliament! But let’s start in Wandsworth. On 6th January, I went to the Battersea Society Annual Dinner: it was an enjoyable, social occasion but not party political in any way. 2. On 14th January, I could have gone to the Honorary Aldermen appointments evening “ceremony” in the Town Hall, but that is one bit of “municipal tom-foolery” that has never appealed to me. I don’t really see why one should be appointed an “honorary alderman” just for having been a councillor for ten year, which is the current qualification – count the years, never mind the real contribution. If my fellow councillor of the last eight years, Wendy Speck, had been appointed one, as I incorrectly said last month, then I might have gone. (Wendy had only been a councillor for 8 years and not 12 as I had thought). 3. On the 16th I went to Sacred Heart School primary school to see an Exhibition of the proposed “improvements” to Falcon (Banana) Park. It was well meaning enough, but, I thought, very much at a detailed level of planting and design – not, I think, an appropriate level for consultation. I hope the works get going before too long because at the moment, as locals will know, the Park is at a muddy, wintery preparations stage – as indeed is the all-weather pitch. 4. The Planning Applications Committee was on 24th January, and once again, had no large development applications of any note. There was, however, one interesting smaller application and that was for a four-storey block of flats behind All Saints Church, Wandsworth High Street. Whilst struggling with the traffic, most of us hardly notice this splendid church (built between 1630-1841). The Committee members wanted to re-assure themselves that the proposed new block of flats would not interfere with the view, unlike the block on the left in this photograph shown here. Most of us agreed that, unless one was on the top-deck of a double-decker bus, the view was safeguarded. 5. Meanwhile, whilst nothing much appears to be happening on the official, formal front of the Council (I mean in Committees or Council meetings), there is plenty of real politics bubbling along under the surface. Latchmere’s Councillor Kate Stock is helping the campaign to save all the facilities at the Children’s Centres in York Gardens and at the Yvonne Carr Centre. Depressingly, under the Tory’s crazy austerity policies, that looks a difficult task. Meanwhile, I speculate that the Tory councillors are wondering just how they are going to manage within next year’s government-reduced budget, without making politically damaging cuts – I doubt that they can do it. Come March/April I suspect that we will see many more cuts, and, I hope, more protests, too. Austerity is clearly damaging our society and we must do what we can to resist it. 6. The community is, however, re-acting to Government failure in many small ways. Last month, I mentioned the litter-picking group, Plog-olution, – a new group responding to the cuts in local authority parks cleaning services. Similarly, this month I have had a leaflet from another litter-picking group called Pick Up, which is leading a people’s campaign against single use plastics. If you are interested then visit them @pickuptheplasticnow, though I have to admit I did not find the website very user friendly. 7. What else? On January 2, Pen and I went to Ross-on-Wye to present a book, Time and History in Pre-history, to Ionwen Williams. How come? Well a couple of years back we went to the Hay Festival and on the way back I saw a sign to Arthur’s Stone in Herefordshire. We drove to the top of a nearby hill, where we found the “pre-historic” remains of the so-called Arthur’s Stone. I got out to take some pics and Pen struck up a conversation with a local farmer, who had personal memories, dating from the 1930s, of walking up to the Stone as a school-girl with her class and singing hymns to purge the pagan spirits. Pen was fascinated by Ionwen’s story so wrote an essay, on the stone’s five and a half millenia story. The essay, accompanied by a couple of my photographs, was published on 1st January in a book of essays by archaeologists. 8. Ross-on-Wye, by the way, is a pretty little market town on the Welsh borders and well worth an over-night stay, if you happen to be passing that way. On a cold and frosty 3rd January, the town looked a picture! 9. Since then, I have had a busy, but mildly disappointing month of shows and films. It started appropriately eleventh day of Christmas with Swan Lake at the Colosseum, lovely music, terrific dancing but stuck in a time warp; went on to the film called The Favourite, enthused over by many, including some of you, but not, I am afraid, by me; I was not prepared to suspend my credulity that far; then Anthony and Cleopatra at the National, which I thought wildly over-directed and over-acted rather as if the Director did not trust the writing, work of some bloke called Shakespeare; and finally to Tina, a homage to Tina Turner. I realise that modern musicals are meant to be loud and screechy but did it have to be quite so loud and screechy? I sound a bit curmudgeonly, like, “It wasn’t like that in my day!” But to be fair, I should say that, most of the audience loved the sing-along finale. 10. Finished off the month with a delightful week-end in Winchester but under-lying everything is my total pre-occupation with and concern about our political mayhem. The Tory party and government are leading us into what I consider to be a complete catastrophe – the beginning of the end of the United Kingdom. As I see it, our position in the world will be much diminished both politically and economically – and just because the Tories have not been clear-sighted enough to throw off the antics of a few Brexiteers. It is remarkable, isn’t it, that most diehard Brexiteers cannot keep a job in the Cabinet for more than just a few days, before they are overwhelmed by the contradictions in their own policies. It also staggers me that the Tory councillors I know on Wandsworth Council blame Labour for the mess! 11. Mind you, I am not suggesting for one moment that the Labour Party, and my colleagues in Parliament, are a clear-sighted, brilliant group pursuing a credible set of political positions. But knowing that the Labour position nationally barely stands examination doesn’t help my mood much either! I think, we will see much soul searching in the next few months. 12. Still March 29th is not only Brexit day, it is also really into Spring and lighter evenings and maybe with the daffodils, these political fears of mine will all turn-out to be unfounded. One compensation may be that, after this farce, we can look forward to the final demise of charlatans like Boris Johnson and Jacob Rees-Mogg. Watch this space. 1. On 6th February, there is a Council Meeting but not I am afraid a very interesting one. It is rather a comment on the sclerotic state of local government that at the very time that this “Austerity Government” is cutting school budgets and destroying the Welfare State, that we 60 councillors will be failing to have any meaningful discussions but rather simply rubber-stamping largely procedural matters. 2. Interested councillors, and certainly me, are going for a guided tour round the Power Station on 7th. And in the evening, I will be at a social for new Labour Party members at the Commons and hosted by our MP, Marsha de Cordova. 3. I have a meeting with some of the design staff at the Power Station on 12th. 4. The Planning Applications Committee is right at the end of the month, on the 27th. Another quiet month! Last month, in honour of Charlotte Despard, the radical, left-wing suffragette, commemorated with a plaque on 12th December, I asked how many could name more than one building or institution in Battersea named after a woman – excluding the Virgin Mary? I was inundated with responses. Here are just a few: Gladys Dimson Hall on the Somerset Estate, the Yvonne Carr Centre on the Patmore (even if actually just in Lambeth, it is nonetheless on a Battersea estate), Joan Bartlett House (Prince of Wales Drive), (Caroline) Ganley Court, Clark-Lawrence Court, Doris Emmerton Court (York Road). Talking of those women my question is do you know anything about any of them? Can you tell me something about three of the six women named? And if this helps, then as a clue I knew three of them and many of you know roughly how long I’ve been in Battersea. It would also be interesting to be told something about the other three! I went to see this new play by Hayley Wareham on Saturday, 16th February. It was staged at the Vaults, Leake Street. What a surprise! What a delight! I used to work at County Hall and have walked through the Leake Street Tunnel a thousand times to have lunch in Lower Marsh. Then (pre-1986) there was nothing there, a few parked cars and nothing but a dark long tunnel. On Saturday, I re-discovered it as the Graffiti Tunnel, with its hollowed-out vaults filled with evening venues, bars and restaurants and performance spaces, including the Vaults. Walking through the Tunnel on Saturday, it reminded me of my first shock of visiting New York, with its rampant graffiti, the smell of spray cans, its ramshackle untidiness, and its challenge to mid-American values. I couldn’t help but think that my late parents, coming into town from Worcester Park, would have found the Tunnel similarly challenging. It was exciting, would the play be equally so? A first play from a new author: the warning lights were flashing red; three young women were standing in what appeared to be the performance area; what were they doing? Then suddenly in unison, they broke out into blank verse; we were off. The play was between the three women on a bare stage with 4 props, three balloons and a cake. It was minimalist and the directing was spare, perhaps spartan. But the dialogue was rich, replete with anger and humour in almost equal parts. It was delivered by the three actors, Isabel Stone, Alice Vilanculo and the author, Wareham herself, sometimes in chorus, sometimes in the round, like a hymn or a madrigal, sometimes solo. It was frequently repetitive, but rather than being boring, the repetition served to emphasise and dramatise the described action, which was about not only male violence against women and their children, but also of the violence of mean, uncaring bureaucracy against women in particular and the poor in general. But the dialogue was not virulently anti-men, nor particularly anti-bureaucratic but more a sad, wry account of the awful destructiveness of inadequate welfare services in a market driven economy. It explored and explained how mother and child victims are gradually isolated by casual relocation away from friends, school and hope. The play was superbly acted by three young women, who avoided the trap of melodramatic exaggeration and coped with a complex inter-play of roles and parts, whilst at the same time delivering the lines both boldly and articulately, which of course speaks volumes for the direction: Director Chris White. One audience colleague pre-announced that he could not quite see how male violence and humour could work together. I think he probably knows now that it can be done and has been done so by this very subtle and mature first play by a promising author. Keep an eye open for Hayley Wareham. On 5th December, there was a Wandsworth Council Meeting, which has become, I am afraid, inconsequential. Why so? Both the frequency and length of Council meetings have been much reduced since I first became a councillor. Hence all the business has been taken out of them, and they have been cleansed of all the controversy, and all the interest, and all the drama. Since Tony Blair’s disastrous reform of local government structures, Council Meetings are the only political forum where the Leader can (sort of – it’s like Prime Minister’s Questions, like May, Wandsworth’s Leader doesn’t really answer the question) be held to account or, if you like, challenged to justify his/her policies. The Leader of Wandsworth Council, Councillor Govindia, is not on any Committee, where he can be given the kind of grilling that is the life-blood of traditional British politics. The old Council Meeting procedure may have been an out-dated process but nothing has replaced it. Govindia is indeed, what Lord Hailsham predicted 40 years ago, an elected dictator (of the Council). PS This is not a party-political point! Labour Leaders in other Boroughs are in a similar position, as indeed is Labour’s Leader of the Opposition, my Latchmere colleague Simon Hogg. We must either restore the old functions of the Council Meetings or put Leaders back into Committees. We must make Leaders regularly accountable once more – and not just at an election, once every four years. The next day Battersea Labour Party ran a Battersea’s Got Talent competition at the Labour Club in Falcon Road. The judges were our MP, Marsha de Cordova, and Yours Truly masquerading as Santa Claus. Frankly, I was really surprised by the high quality of some of the performances, especially from our juggler, Ben. It was such an unusual display but, unfortunately due no doubt to a lack of practice, there were a few dropped catches. So, we decided to award the first prize to our saxophonist, Pete Lyons, and his accompanist, on the trumpet, Martin Linton – formerly Battersea’s MP. On 7th December, the Labour councillors had a Christmas dinner at Latchmere’s Fish in a Tie restaurant. I was persuaded to join the wilder, and maybe slightly younger, spirits of the party for further drinks at the Revolution Bar in Clapham Junction. I was rather surprised to be accosted by the bouncers with a demand for my ID, it being some time since I had to prove that I am over 17. But having got “my party” in, I must confess that I decided to walk home and leave them to it. A group, called the Friends of Christchurch Gardens, organised an al fresco morning barbecue on Sunday, 9th December. The aim of the Group is to help tend and care for the Gardens on the corner of Cabul and Battersea Park Roads. It is, of course, the Council’s responsibility but, especially in these “austerity times” it is also for the local community to respond – and the community has in this case; 30-40 people turned up. Good luck to the Friends in the future. Talking of which, have you come across a Group called The Plog-olution? I don’t like the name, either; but it is an interesting local development. According to its web-site this group started in Putney and was a spontaneous public reaction to the parlous state of our public spaces. I came across maybe 20 of them, all tee-shirted, jogging around Clapham Common, collecting bags and bags of litter as they went. They have scoured the Thames riverside and Putney Heath, amongst other local public spaces. It is a fast-growing and spontaneous reaction to cuts in public expenditure – look them up at www.plogolution.com. The Planning Applications Committee, on the 13th December, was dominated by an application for a large development on the corner of Lombard and York Roads. Readers might know the site because it is currently occupied by a Halfords Store and a Pet Store. The proposal is to demolish the existing buildings and replace them with a six storey self-storage facility, including artists’ studios and so-called flexible office space plus a 4, 6, 8, 13 and 20 storey development of 168 residential units with ground floor shopping and 71 office spaces on the first and second floors. The proposal would also include 64 basement car parking spaces and 344 cycle parking spaces, plus ground floor parking and loading space for the self-storage building and surface level access and service areas. At the same time there will also be landscaped areas including the formation of a new square on Lombard Road and widened, landscaped footways. You might like me, wonder how all this will fit onto this relatively small site. I am not quite sure even having seen all the plans! The Lombard/York/Plough Road junction area is clearly destined to become, or already is, the centre of a number of very sizeable developments. The area will soon be very different from what it was five years ago and a good job too. Then it was, one has to admit, blighted and ramshackle. But I am concerned that we do not get simply more expensive and largely empty “boxes in the sky”. If the current down-turn in the property market continues beyond Brexit, as surely it will, then these massive developments are in danger of becoming expensive white elephants, loved by some but very unpopular with many. On 14th December, our MP, Marsha de Cordova, unveiled a blue plaque to Charlotte Despard on the Battersea Labour Party’s office at 177 Lavender Hill. Despard, who stood as the Labour Party candidate for the General Election exactly 100 years earlier in 1918, donated 177 to the party. During her long life, she was not only a suffragette but a doughty campaigner against many right-wing and for as many left-wing causes. For those, who are interested you can read ‘Why is the Remarkable Charlotte Despard not Better Known?’ in P Corfield’s blog at https://www.penelopejcorfield.com/monthly-blogs/. Afterwards there was a party and speeches just across the road in the Battersea Arts Centre. Speakers included Polly Toynbee, seen speaking here, Battersea’s own feminist campaigner Jeanne Rathbone and Sara Apps(Linton). It was a very successful event. One day in mid- December, I was going along the Latchmere Road where I was captivated by this sight of a magnificent Steam Train, quietly sitting on the bridge. It was puffing gently, rather like a senior citizen relaxing with a big, fat cigar. It didn’t stay very long and, when it burst into action, it gave one just a little flavour of what Battersea must have been like before electric trains replaced these romantic but filthy monsters! This particular example regularly pulls an excursion train on trips out of Victoria. 20th December was a busy Christmas event day for me with the Battersea Park Rotary club lunch and the Battersea Society drinks in the evening at the Duke of Cambridge. It was encouraging to see lots of new blood at both events and both organisations seem to be in rude health. On Boxing Day, we went to Winchester to see daughter and son-in-law’s new house – very nice. In the afternoon, we walked, along with what seemed like every other resident of the city, up and over St. Catherine’s Hill, a steep if small hill commanding a great view over the Itchen Valley, the city and the cathedral. At the top there is an iron age fort and a charming cut pattern in the grass called the MizMaze, pictured here. It is old, but not so old, with best estimates suggesting that it was cut in the seventeenth century. It is a continuous 624 metre-long walk. I walked every step of the way – as you can see from the picture it was easy but did call for some self-discipline! However, I am afraid, St. Catherine’s Hill is so popular and so trampled on that I do think it is time someone started thinking about the need for ecological protection of both fort and Maze! We had actually done the same walk with the family on 2nd December. But then, it had been very wet and slippery on a firm chalk base. So, guess what? On the way down, Penny went head over heels and landed head first, fortunately, in a patch of soft, if soaking grass; and, immediately afterwards, I fell over and gave myself a black eye – and I wasn’t laughing at the time, as some unkindly suggested! Between Christmas and New Year’s Eve, we have been to a couple of shows, Company at the Gielgud Theatre, Shaftesbury Lane, on 28th and The Double Dealer at the Orange Tree Theatre, Richmond on 29th. Pen was a bit disappointed with the first, protesting that a musical really should have some dancing – she can be so traditional! But I must confess that I wasn’t smitten either. It was very cleverly staged and superbly directed, handling the constant change of players and sets with smooth professionalism. The quality of the songs and performances could not, however, make up for the lack of plot or character development. The Double Dealer was, however, completely different. Congreve’s Restoration Comedy (1693) is, like all Restoration Comedies, bawdy, slap-stick, enjoyable and wildly improbable. The plot changes with manic rapidity and is far too complex to follow – at least by me. A review of the play will appear shortly in the Criticks [sic] section of the British Society for Eighteenth-Century Studies website at https://www.bsecs.org.uk/. The Orange Tree Theatre itself is a very intimate little theatre and one is literally in touching distance of the actors, who all seemed to be having great fun playing their parts. The theatre also has the great advantage of terrific convenience – for Battersea residents. You can easily be at Clapham Junction, platform 6, and in the theatre within 15 minutes and as the play runs until late January, why not give it a try? In the quieter period since Christmas I have done a bit of gardening and some thinking about the mess that the country and the political parties are in about Brexit. There seem to be very few options. I reckon that realistically there are four: a delay and extension of Article 50; May’s deal; a no deal Brexit; or an about turn engineered either by Parliament or a Second Referendum. The second option is May’s deal. It might work because everyone can see that it is, at least, a possibility, even if it is a worse option that staying in the EU as we are now. Any Labour fantasy that Jeremy Corbyn will be able to negotiate a better deal is precisely that – a fantasy, that surely not even the Labour Leadership can take seriously. The No-Deal Brexit option, once so beloved by Boris Johnson, is no longer taken seriously even by Liam Fox. The majority of Labour members especially here in London would be horrified. There is so much opposition to this option that it is likely, but not certain, to be a non-runner, but either way, Labour has no interest in it. Lastly, the About-Turn option could happen like a flash of lightening as MPs realise that this issue is bigger than their individual careers and ambitions. However, an About-Turn seems unlikely without either a Second Referendum and/or a General Election. In the event of either of those, then Labour’s position is likely to be decisive but only if it comes out with a strong Remain position. If Labour doesn’t do that, then it will be playing second fiddle, at best, to the Government and the Brexiters, and hence failing the primary duty of The Opposition and that is to oppose and pose an alternative for the public to choose. If Labour does come out for a strong Remain position, however, there will of course be serious issues to address in many parts of the country outside London, but these issues need to be tackled anyway. If Jeremy Corbyn and the Labour Party do not wake up to this challenge, then, in my view, we will never be forgiven. But there is one version of the About-Turn, which no one has addressed. In the nineteenth century Disraeli reversed traditional Tory Party when he famously and infamously “dished the Whigs” by stealing their policies and subsequently winning the General Election. What if May, similarly, suddenly declared that she had genuinely tried her best to deliver Brexit but could not command a majority in the House of Commons; that in fact the Leave campaign had not been proved viable; and that she was now going to keep the UK in the EU. My guess is that she would win the day! Given the terrible state of our politics, I guess we might well go for the first of these options – i.e. kicking the can further down the road. And maybe the EU will let us get away with that for a while. But just why should it; the EU has business to get on with too and Britain will soon be forced to decide between the other options. In this short-term play, the Government is likely to be the only player whilst others can only watch and comment. December has been a bad month for my old pal, Sadiq Khan, Mayor of London, but an even worse one for senior management at Transport for London or TfL. Early in the month it was announced that Crossrail was going to be delayed by nine months – perhaps no surprise on such a mammoth project. But this announcement was so sudden and so late that questions need to be asked of TfL. Then at the end of the month, it was announced that the Northern Line Extension to Battersea Power Station was also delayed – this time by a year. I can’t help thinking, with Oscar Wilde, that one major delay might be bad luck but two seems like bad TfL management. My colleague, Latchmere Councillor Kate Stock, is getting more and more concerned about the future of the York Gardens Children’s Centre. The Council is not as yet being very explicit about its future but it is clear that the services will be much reduced. I know she would appreciate support from you. So, please write to Councillor Govindia, Leader of Wandsworth Council rgovindia@wandsworth.gov.uk, copied to cllr.k.stock@wandsworth.gov.uk, I know she would appreciate it. Finally, I was pleased to hear that Victoria Rodney, of the Mercy Foundation, Falcon Road, received an MBE in the New Year’s Honours List. I was asked last spring to write a reference for Victoria in support of her nomination and was more than happy to do so. Victoria, largely out of her own pocket, established the Mercy Foundation to help and support some of the most disadvantaged people in our community, with teaching in English, basic IT and other skills. She is both a warm-hearted and loving person and a woman of considerable tenacity and drive. Congratulations, Victoria. On 6th January, I have the Battersea Society’s Annual Dinner. On 8th January there is a meeting of Wandsworth’s Conservation Area Advisory Committee. And on the following day there is another lunch-time Opera Recital given by the international students of Wandsworth’s National Opera School. It is held in Wandsworth Town Centre and is usually about one hour long. It is some of the highest quality entertainment that can be had – entirely free! On Monday, 14th January we have the Honorary Aldermen Ceremony at the Town Hall. I must confess that I am a bit conflicted about this. Honouring councillors merely because they have been councillors for eight years, or is it 10 seems to me to smack just too much of what one old friend of mine would have called municipal tomfoolery. I have never been to the occasion, but as this year one of the recipients is my old Latchmere colleague, Wendy Speck, I might just make an exception! On the 24th January the Planning Applications Committee will end what, for me, is a light month. My question last month was as the Battersea Chess Club claims to be the oldest, continuingly functional chess club in the country, when was the nearest date to its foundation 1850, 1900 or 1950? The club was actually founded in 1885 and so the correct answer was 1900. And this month? In honour of Despard, name more than one building or institution (e.g. school or hospital) in Battersea named after a woman – excluding the Virgin, Mary? On 1st November, I went to the Commons for our (Battersea’s Labour councillors) monthly meeting with the MP, Marsha de Cordova. What a change has taken place in Westminster over the last 40 years, (no) thanks to terrorists! I can remember just walking in off the street to meet the MP and then going up to the public gallery to listen to the debate. But now, understandably, one has to go through body searches both mechanical and manual and then undress (well take off belts, shoes, etc. – it’s just like flying). And as for the public gallery, what was a fascinatingly real experience now has to be viewed through bullet-proof glass. All justifiable, I suppose, but to put it mildly a crying shame. Terrorism certainly has been effective at some things. The meeting – oh nothing special; just party business. The following day, we went to Battersea Arts Centre (BAC) to see Chekhov’s First Play by Ben Kidd and Bush Moukarzel. It was a play about perceptions of people and truths and as such very ambitious, but unfortunately it did not work for me; I simply left a little lost and not persuaded. I guess that it is what should be expected from experimental theatre and it did seem to work for many in the audience. It was also the first time that I had been to what was, before the disastrous 2016 blaze, the Grand Hall. Have you been? It’s well worth a visit, along with the other new features of the Arts Centre. Contentiously, the designers have left much of the building cleaned up but simply as the fire left it. I am not sure that works as it looks a bit dark and miserable for my taste. But there is nothing irreparable about that and it could be put right, in my view, by a good plasterer and a bit of paint, or pictures or murals or even tapestries! What used to be the Lower Town Hall has been converted into a work hub and I think it looks really good. The object is to supply nursery space for seed businesses. There is work-space and access to computing resources, meeting rooms and a community of small creative and/or start-up businesses. Throughout the Arts Centre you can find small spaces where the wall-paper is designed by Nicholas Hughes, especially for BAC. It is a brief pictorial representation of some of Battersea’s history. So apart from the Town Hall itself, you can find John Archer, the first black mayor of a major authority (Battersea, 1913-14); the statue of the Brown Dog, the cause of the Brown Dog Riots, 1903-10; John Burns, MP and the first working class member of the Cabinet, 1905-10; and Pluto, the BAC cat (now retired). A busy but stimulating wall-paper design. On Sunday, 4th November, I and maybe 100 other London councillors from all parties went to Camden Town to Jewish London: A Seminar for Councillors at the Ort House Conference Centre. It was organised by London’s Jewish Community, I imagine, in the light of the perceived rise in ethnic and religious tensions in Britain. It was informative about Jewish views on such things as Faith Schools and on Jewish concerns about anti-Semitism in the UK and, specifically, in London. As it happens, I am opposed to Faith Schools in principle, so there were limits to my support, but that didn’t stop the conference being an interesting and educative experience. On 6th November, I played for Battersea Chess Club against Hammersmith and Fulham Chess Club. For those interested in these things, I do not have a national grading as this was my first competitive game (except against my brother-in-law at Xmas) for many years, certainly this century! My opponent, Andy Routledge, was graded 128; we were playing on board 25! I think we are the largest two clubs in the country. He won but I was holding my own until about move 26 – so not too bad! I went to the club again, which meets every Tuesday at the Labour Club in Falcon Road, on 20th November. As you can see in the picture, it was set up for a massive event – there were well over 100 players – so I joined in. What a mistake! I found myself playing eight three-minute games in quick succession and being hammered in every one of them. The club write-up the next day said “It was as big a night as we’ve ever held with 12 International Masters, five Grandmasters and a host of well-known faces in the chess world at the club”. This experience should teach me to read meeting notices properly! I had a pleasant lunch with Wandsworth and Merton’s GLAM (Greater London Authority Member), Leonie Cooper, on 7th November and also had a brief chat with Labour’s Leader on the Greater London Authority, Len Duvall. On 9th November we went over to the Clapham Picture House to see Mike Leigh’s film, Peterloo. Leigh certainly picks some interesting subjects such as the great painter J M Turner and is clearly interested in the very early nineteenth century, when Turner was working. The Peterloo Massacre took place in 1819; fifteen demonstrators died in a clash with the military. It was a major moment in the development of British radicalism; it marked a stage in the advance of suffrage, with the Great Reform Act following 13 years later. It should make the subject of a great film, and it certainly is a good-looking one, but I am afraid that there is something wooden about Leigh’s film; it’s almost an oil painting. What did others think? Oh, on the same theme, the TV special of the month was, I suggest, They Shall Not Grow Old – were you a big fan or again like me, impressed but not wowed by the technological wizardry? Then on Saturday, 10th, I went to Providence House’s Annual Fund-Raising Dinner. Providence House, under the devoted leadership of Robert Musgrave, is one of the most successful and few remaining youth clubs in Battersea. With so many of us concerned about knife crime and the vulnerability of youth in today’s society, it is essential that clubs like Providence get everyone’s full support. It was a great evening, for the best of causes. The Remembrance Day Sunday Service on 11th November was something special because it was, of course, the centenary of the end of the World War, aka The War to End all Wars – if only. The Vicar of St. Mary’s Church, Canon Simon Butler, gave an admirably thoughtful and ecumenical sermon – it was brimming with understanding and compassion. If I were a practising Anglican, he would be just the kind of vicar I would like. The Civic Awards Ceremony took place on 13th November. This event gives an annual opportunity for the community to thank some individuals for the outstanding contributions they make to our society. One of the seven winners was, this year, a Latchmere resident, and, she told me, a regular reader of this newsletter. Ayan is, and for several years has been, a leading light in the Association of Somali Women and Children. The Planning Applications Committee, on the 21st November, was, if possible, even less substantial (about back extensions and the like, not over-sized developments) than last month. Is this a major indicator of the economy turning down even further than it has already? I suspect so. On 24th November, we went to see Peter Groom’s Dietrich at Walton’s Musical Hall, Wapping. I thought it was a brilliant performance and have said so in my review on my website at https://tonybelton.wordpress.com/2018/11/28/review-of-peter-grooms-dietrich/ The picture illustrates Groom’s very androgynous but sensual performance. On 25th November, the Latchmere Labour Party had a pub quiz night at the Anchor pub, Hope Street. Not of itself of particular note, but just to flag up that it looks unlikely that we shall keep this nice, little local unless it gets a bit more custom. It’s such a dilemma for the pub business as in their desperate bid to maintain custom, they sometimes provide loud, noisy entertainment. I have already had (reasonable) complaints from neighbours about the Anchor! Let’s hope any disputes are amicably resolved and the pub thrives. the Council has consulted on the possibility of proceeding with the new pedestrian and cycle only Pimlico Bridge. I think that it is unlikely to be built, because Westminster Council is against it. Hence, I don’t think that it’s worth us Battersea Labour councillors opposing it and getting bracketed as “refuseniks” – but all my colleagues think I am wrong! I guess you win some and lose others! the Council’s consultation on the future of the York Gardens Children’s Centre can be viewed at https://haveyoursay.citizenspace.com/wandsworthcsd/childrens-centres-18/consult_view/. In theory, consultation ended on 3rd December, but legal decisions have shown that any responses, made before the final decision, have to be taken into account, so don’t be put off! The Children’s Centre is under threat so respond now! On 6th December, I have the final Council Meeting of the Year. I am due to speak on the Regeneration Programme for the Winstanley Estate. I am a little concerned that when we vote against the Council paper, there will be a possibility that our opposition will be mis-understood. I want to make it clear that we will NOT be voting against the re-development and the improvement of the estate, as such, but against the amount of private as opposed to public housing that will replace the current buildings. On Sunday, 9th December, I hope to go to a meeting of the newly formed Friends of Christ Church Gardens. On 12th December there will be a commemoration service for the 35 passengers, who died in the (so-called – actually Battersea) Clapham Train crash of 1988 and, totally separately, the funeral of long since retired Wandsworth Chief Executive, Albert Newman. I will go to Albert’s funeral. And as its December, I suspect that there will be the Battersea Society, the Battersea Park Rotary Club, etc., etc. Xmas socials! And, of course, there is the tragi-comedy of Brexit to be played out! At the time of writing, the Government had merely been defeated three times in the Commons. When will we all come to our senses? Last month, I asked, “Just what are these posts? What do they de-note? And how many of them do you know?” These two, on Wix Lane, mark the Battersea and Clapham Parish boundaries. If you want to know more and there are many more, all documented by my old friend Philip Beddows and co-founder with me of the Love Battersea website. See https://sites.google.com/site/lovebatterseacampaign/batterseaboundarymarkers. Went to Wilson’s Music Hall last Saturday to see this one man show, written and created by young actor Peter Groom – and it was a show and not quite a play, a 75 minute, no breaks, no interval show – what an evening, what a show. Groom recounts a short version of the most traumatic years of Marlene Dietrich’s life and sings a dozen of her songs. He starts by mimicking Dietrich brilliantly and convincingly but over the course of the show he seems to think that evoking the sensuality and abstraction of “Marlene” is more important than slavish imitation. He is right. Groom’s androgynous manner and slim figure equip him to “be” Marlene with absolute conviction. He has mastered a feminine walk and Dietrich’s bold, almost aggressive stance. Dietrich, a German woman, was plucked from the Berlin stage in 1939 by Hollywood director Josef von Sternberg and taken to the city of dreams, Hollywood. There she lived the nightmare of a patriotic German, who, loathing Nazism, took American citizenship, inevitably deserting her mother until after the war. Groom played Dietrich as a person displaced from her nation but also displaced from her personality, her loves and life. Her appeal to men emphasises this “quality” of abstraction, including abstraction about men, who she sees as subservient beings of a lower, more vulnerable order. If you have never been to Wilton’s, it is a genuine, restored nineteenth century musical hall, which is well worth the visit, even if the Wapping location is not easy from Battersea. There is a bar and bar food, well at least pizza; the environment is very informal; the clientele was, at least on Saturday, 24th November 2018, fairly young and fairly gay. And to make the perfect evening I got back to see Spurs thrash Chelsea 3:1 on Match of the Day and it should have been 6, 7 or 8:0. A very satisfactory end to the day. Peter Groom was a five-star performer in Dietrich at the 2018 Edinburgh Festival and is apparently repeating the performance at the 2019 Brighton Festival. Go and see him/her. On 2nd October, I went to an Exhibition in the Brewer’s pub, opposite the Town Hall, of plans for the redevelopment of the Ferrier Street industrial site just by Wandsworth Town station. It interested me, because I played a large part in its development in the 1970s. Prior to then it had been a rundown area of terraced properties until the Labour Council of the time organised a vote of residents as to whether they wanted their housing “compulsorily purchased” by the Council or not. By a substantial majority, the residents, largely private sector tenants, voted for compulsory purchase. The end result was that they got re-housed by the Council and the Council became the owners of what became an industrial estate. Sold off in the early 2000s, the area looks likely to revert to mixed industrial and housing usage. For me, the startling thing is that I have lived through the complete life-cycle of a block of property from the first plans to demolition and redevelopment and now to the next set of plans, to be followed now by another demolition and re-development! As I said last month, on 5th October I went to Reykjavik, Iceland, to accompany my partner who was lecturing to an Icelandic historic society on “Meetings and Greetings in the Eighteenth Century”. We then spent a few days driving round the island. 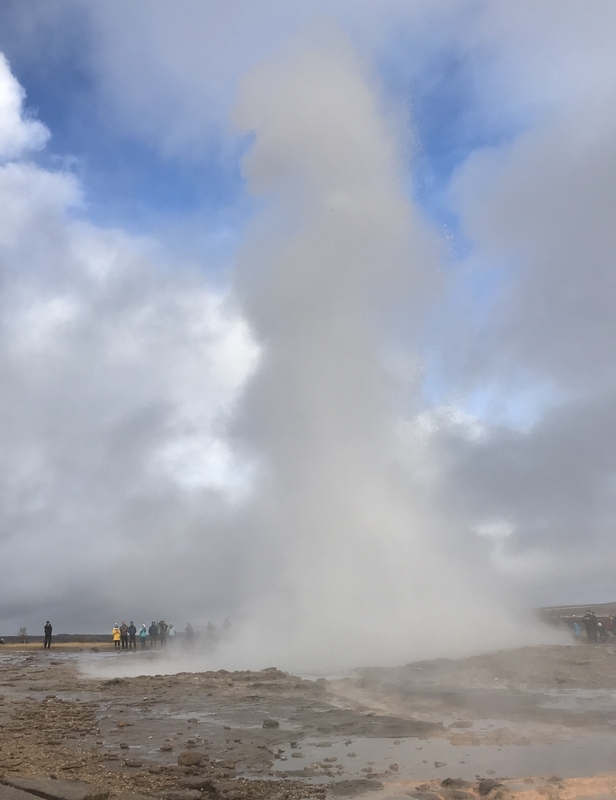 Many will know about the fish, the Northern Lights, hot geysers (the picture is of the active Strokkur Geyser), and volcanoes, and almost everyone will remember Iceland beating England in the 2016 European Championship. But, how many know that in the 2008 financial crash, the Icelandic stock market lost 95% of its value, the currency was devalued by 25%, and virtually every private business in Iceland went bankrupt. Ten years later, there is not much sign of any of that! So, how did such a small country manage to pull itself round? It isn’t physically very small but it has a population of only 320,000 – rather less than Wandsworth. After the crash, Icelanders had an important national debate and since then they seem to have pulled together in an impressive way – quite unlike Brexit-torn Britain. Having suffered from over-fishing and facing financial disaster, Icelanders seem to have decided as a national policy to concentrate on tourism! Of course, it’s not exactly Sun, Sea and Sand tourism, Costa Brava style, but rather rugged and wild, dramatic and exciting tourism with volcanoes, lava fields, dozens of waterfalls, geothermal pools, whale watching, bird and seal spotting, pony trekking, and mountaineering. When I got back, my first Council engagement was with a Wandsworth Youth Parliament seminar. During the course of the evening about 15 or 16 secondary school pupils from all of the Borough’s secondary schools both quizzed and challenged about 15 or 16 councillors from both the Tory and Labour Parties on such matters as policing, health and social services, education and housing. It was an entertaining and educative session. The next day, 17th October, I was off, rather unenthusiastically, to the Wandsworth Council Meeting. Council meetings have long ago had their whole heart and purpose ripped out of them. Nowadays they are so short – about one and a half hours after the obligatory prayers, questions and announcements – and so infrequent – about four or five a year – that they are no longer where council policy is decided. That is done on social media, or in secret, closed meetings. The Council meetings, themselves, are good for councillors to exercise their oratorical talents, but that’s about it. On this occasion, there were about ten maiden speeches, that is a councillor’s first speech in Council. Most of them were very good, BUT why would anyone go to the Council Chamber to listen to them unless they were relatives or part of the councillor club? These meetings really do need a re-think! The next night, 18th October, was the Planning Applications Committee, but there was not much of general interest to Battersea on the agenda, unless you live on Battersea Reach, where the development company,St. George’s, are in dispute with residents over car parking. I hope that things can be sorted amicably, but alas I have my doubts. On the morning of Saturday, 20th October 2018, I was wheeled out as the token man at the unveiling of a plaque to Caroline Ganley. I was delighted to be there, at 5 Thirsk Road, where Caroline lived for most of her life. See below (in Did you know?) for far more about Mrs. Ganley’s achievements. The picture shows some of Caroline’s grand-children and other relatives as well as the “unveiling party”. For me, the staggering feature of the political month, has been Labour’s almost total silence on Brexit. The Tories are, of course, in a complete funk, and yet somehow they retain their very small lead in the opinion polls. How can that be? All I can think, is that the lack of clarity on Labour’s part is making it very difficult for the public to decide, who to support. Do they support the Tories, who are making such a shambles of the whole thing? Impossible! Or do they support Labour, which has not yet summoned up the courage to give a lead – apparently not! It is still possible, I guess, to think that Corbyn and McDonnell are playing an absolute blinder, leaving the Tories out there to dry and not yet exposing the Labour Party’s own divisions. But, it is clear that whilst Party members are over-whelmingly “Remainers”, a sack full of MPs represent constituencies, that voted to leave – as some might say, horns of a dilemma! But how much longer can Corbyn sit on this particular fence? Surely, he has to plump before 29th March and if he doesn’t then, in my judgement, he will suffer for it. 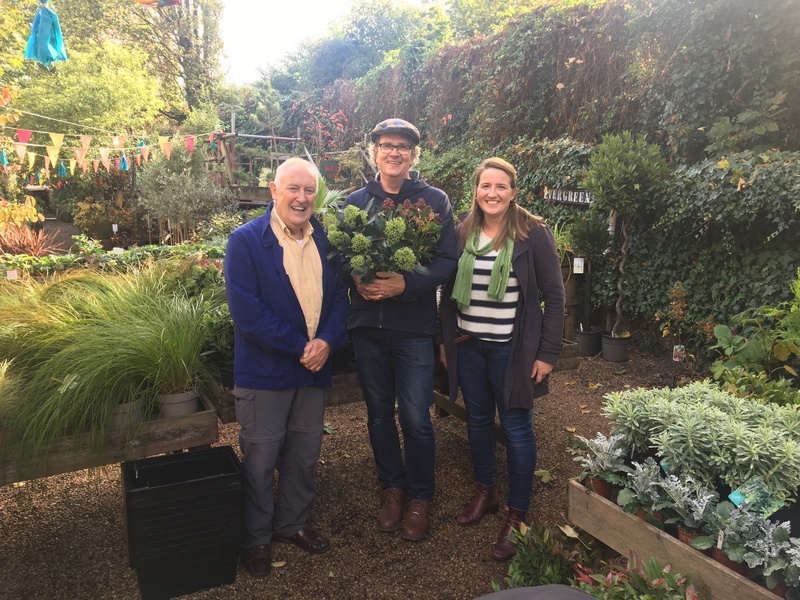 And talking of Brexit, on 26th October, my fellow councillor, Kate Stock and I, visited the Battersea Flower Centre to campaign for the London Living Wage (LLW). There we met John Schofield, who runs the Centre, and was proud to assure us that his dozen staff all earn, at least, the LLW. He was most interesting, however, when talking about how Brexit was already affecting him. He pointed out that the Netherlands was very important to his industry and that the devaluation of the pound relative to the Euro was already causing flower traders severe problems. On 28th October, we went to the Bread and Roses pub in Clapham Manor Street to hear Battersea Labour Party’s (BLP’s) own jazz band, Junction Jazz, not that they exactly brand themselves BLP’s band, but many of them live in Battersea and they do support BLP. They really are getting very good and have expanded their repertoire; I don’t know the correct jargon but, on this occasion, there was quite a lot of Miles Davis-style orchestration, which I did not recognise from previous performances. In the past they have had Rosena Allin-Khan, Tooting’s MP, as a guest singer. On this occasion, Martin Linton, Battersea MP 1997-2010, was a guest on the trumpet – and very good he was too. On 30th October, I joined the Housing Department staff, my Latchmere colleague, Councillor Kate Stock and Tory, Councillor Rodhri Morgan, Deputy-Chair of the Housing Committee, on a tour of the Latchmere and Wilditch Estates. It was pretty cold, and we made a few notes about litter, etc., but we saw no evidence of major problems. On the 31st I spent lunch-time at the National Opera Studio in Wandsworth, listening to songs performed by this year’s students – not quite as good as last year’s, I thought, but still an amazing free concert in the heart of the Borough. On 1st November, I have my monthly meeting with MP, Marsha de Cordova, and the other six Battersea Labour councillors. I know that the agenda will include the future of the 19 bus and the drug rehabilitation centre on the Doddington Estate. The following day, we are going to Battersea Arts Centre to see a play about Chekhov’s First Play, a tragi-comedy (I am guessing) about the art of writing! It will be the first time that we have seen a performance at the Grand Hall, as it used to be called, since it burnt down – should be interesting. The Jewish Board of Deputies have invited councillors to a Jewish London: A Seminar for Councillors on 4th November. I assume that the Board of Deputies has become concerned about the growth of Anti-Semitism in Britain. In my experience, this is a first of its kind; several Wandsworth councillors will be in attendance. On the 5th November, no doubt with fireworks exploding all round us, I have a meeting of the Conservation Area Committee. A day later, I will play my first match as a member of the Battersea Chess Club (BCC) against Hammersmith Chess Club. What a club, BCC is! The oldest chess club in London, it numbers amongst its members a nine-year old rated as one of the top two players in his age group in the world. I used to play for my school team, many moons ago. This will be my first game since then! On the 7th I am having lunch with Leonie Cooper, Wandsworth and Merton’s Greater London Assembly Member or GLAM, as she jokingly likes to boast. On the evening of 10th November, I and other Labour councillors will be going to the Providence House annual fund-raising dinner. The day after, I will be at St. Mary’s to mark the centenary of Armistice Day, 1918. On the 13th November, Wandsworth’s Civic Awards will, as ever, be an occasion when the Borough notes and applauds the voluntary contributions made by many of our fellow residents. On 17th November, the London Summit takes place at the Guildhall. All London councillors are invited and the conference will be addressed by Ministers and the Mayor. November’s Planning Applications Committee will be on the 21st. On 22nd November, I am due to go to Waltham Forest to see that Council’s ideas on how to reduce car usage and to keep pedestrians away from the motor car. Last month, I asked what any of you knew about Caroline Ganley, pictured here. I am afraid that the only responses I got were from those I might call the “usual suspects”, including my friend Jeanne Rathbone, whose research is the basis of the following. A very brief summary of the long life of Caroline Ganley would note that she lived from 1871-1966 and continuously from 1910 until her death at 5 Thirsk Road, where a plaque was unveiled on 20th October..
Ganley was elected to Battersea Borough Council in 1919, one of the first female councillors in the country. 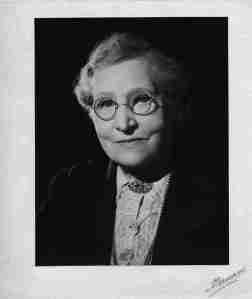 She was a stalwart of the Labour Party and of the Co-operative Movement, becoming in 1942 the first woman President of the London Cooperative Society. In 1920, she was also appointed as one of the first female Justices of the Peace. In 1945, Mrs Ganley was elected to Parliament as the MP for Battersea South, where she stayed until 1951. Most unusually for former MPs she returned as a Councillor to Battersea Borough Council in 1953, where she served until the Council was abolished in 1965. And my question this month is: Just what are these posts? What do they de-note? And how many of them do you know? .……… it raised the question who signed off on the block, the answer being precisely your scenario of privately contracted building inspector engaged by the developer. I cannot express how inadequate their response was when we took the issue up with them. The particular fire safety point may have been signed off without the inspector ever actually having viewed the property. I suspect an endemic issue of private inspectors ‘waving through’ building sign offs, partly due to being paid flat fees which incentivise ‘light touch’ engagement, and partly being concerned not to raise issues which discourage repeat business from developers. Surely this quotation is proof enough that there is a problem, and Grenfell is a massive statement about how serious it is. We need fresh legislation to re-establish a simple regulatory regime, with an established, reliable and respected inspectorate – not a random set of freelance experts not subject to official validation. 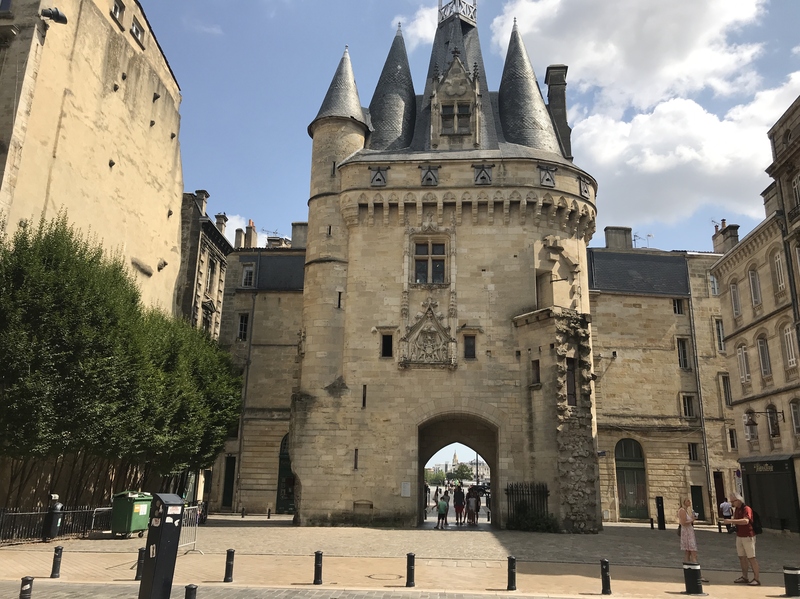 Ever been to Bordeaux? Not many of my friends have done anything more than pass through. It is actually worth a bit more than that. The fundamentally 18th century centre has been re-engineered around four or five brand new tram lines and is almost entirely pedestrianised. OK, it’s a relatively small city by London standards, but it was so pleasant walking around the town day and night, without having to dodge cars, or breathe their fumes, and to hear laughter and voices across the road. We went by train and then flew from Bordeaux to Croatia, where we stayed in the same fishing village that we have stayed in for five years – lots of swimming, reading Trollope’s The Way We Live Now and fish, fish for breakfast, lunch and dinner! 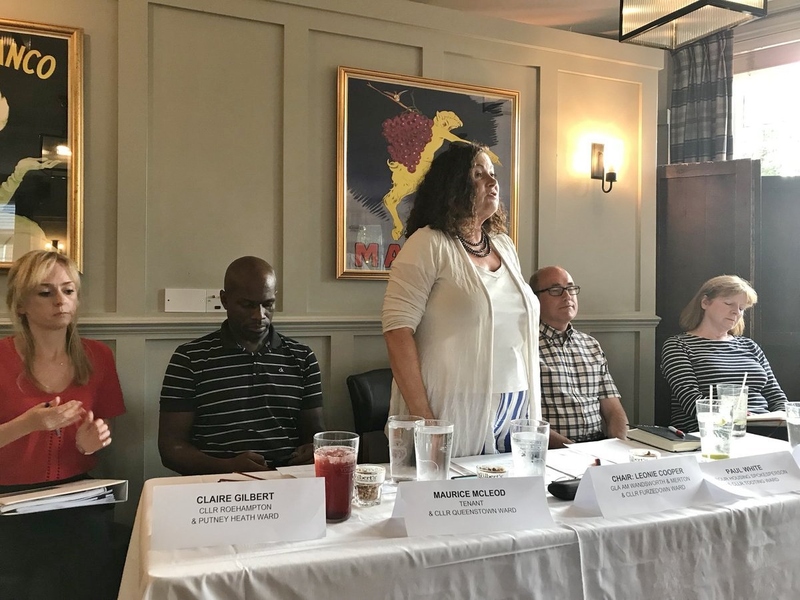 Whilst I was away my fellow Labour councillors organised a public meeting about Wandsworth Council’s response to fire hazards in multi-storey tower blocks. It was held at the Alma pub and was a reaction to the apparent intention of the Council to install sprinkler systems in all 10+ storey blocks. It was an understandable reaction to Grenfell but it was essentially a knee-jerk one. For example, the Council did not suggest even the most cursory of inspections, when a moment’s thought might have suggested that Grenfell-style risks are much reduced where there are separate staircases at either end of blocks, such as on the Doddington estate, or where the construction method was traditional brick and mortar, such as Battersea Fields, or where cladding had or had not been used. Given also that it appears as though leaseholders could be charged up to £5,000 each for an installation they do not want and which may be of only dubious purpose, it is not surprising that there is a head of steam against the proposal. The meeting was held on Sunday, 2nd September, and was packed out with at least 100 tenants and leaseholders in attendance. It was chaired by the vastly experienced councillor and Wandsworth Greater London Assembly member Leonie Cooper, standing centre. The other four councillors on the platform as shown in this picture were Claire Gilbert (Roehampton), Maurice McLeod (Queenstown), Paul White (Tooting) and Angela Ireland (West Hill). Of these four, three were only elected in May, less than four months before this meeting. They organised and ran the whole meeting in what was quite an impressive baptism as it appeared to this “mature” councillor then sunning himself in Croatia. Well done to the team. On the 18th September I had the Strategic Planning and Transportation Committee, which had one of the lightest agendas I can ever recall. There was, however, an interesting paper on how to remould Battersea High Street, and especially the market, into a street just about worthy of the name. Unfortunately, I didn’t think the Council’s paper was up to the task (and it was amazingly expensive for what it proposed), but improvements to the High Street are now, as they say, on the agenda and I hope to see some exciting ideas coming forward. The next day, 19th September, I had the Planning Applications Committee. At first glance, there did not seem much of interest but further study proved otherwise. There was new detail on the mega-development of the old post office sorting office site in Nine Elms. The application from US company, Greystar, was for 894 BtR (Build to Rent) units. This was one of the first and definitely the largest appearance in the UK of the US housing product, BtR. Yes, I hate the phrasing too – “housing product” – Ugh! The Tory majority on the Committee were really proud that this new “product” should be coming to the Borough, making us a pioneer of a new, efficient, privately rented sector. For everyone’s peace of mind, I hope that they are right, but I suspect that corporate America invading our housing market is going to have similar impacts as Uber to taxi services, Amazon to high street shopping and PayPal to subscription services, etc. It will put pressure on our own landlords at the medium and top end of the market and in the end leave local authorities and housing associations to pick up all the pieces at the lower end of the market. The second interesting application was for a housing development on the site of the old Balham Bowls Club, Ramsden Road. I found this rather sad, because it meant the loss of a pub’s bowling green. I don’t know how many pubs in the country, let alone in Inner London, still have their own bowling greens (I know one in Suffolk), but I wouldn’t mind betting that this was the last in London – gone for ever. Meanwhile, in another interesting indication of how the market is moving, the Council has taken enforcement action against a property in Battersea being used as an Airbnb property. I haven’t come across this much but a fellow councillor in Tooting tells me that he is plagued with 100 or so Airbnb (or similar company) “hires” usually of private houses, which are being used as vice dens or party locations. I would be interested to know if any of you are experiencing similar problems associated with this trend, here in Battersea. I went back to my old college on 22nd September. About a dozen of us, from further back than I care to admit, met up for dinner and a drink or two. It was great fun, but it meant that I totally missed London’s Car Free Day and no one has mentioned it to me either – I guess that means it was a bit of a non-event, which is a shame. It becomes clearer by the day exactly what damage is being done to our environment (and our health) by the internal combustion motor car – a great pleasure but also a killer! I didn’t go to Liverpool for the Labour Party Conference but it appears to have gone rather better than many expected. Last month, I said that if Brexit is a disaster and if Labour hasn’t had the courage to take a stand on the issue, then the Labour Party will pay a heavy price. I suspect that Keir Starmer has created enough space, just about, for Labour to avoid that trap and come out of this sorry saga in not too bad a shape. How come he doesn’t get mentioned as being the next Leader? OK, not being a woman is a handicap, but not even getting a mention! I suspect that there are quite a few Tories, who rather desperately hope to leave their Conference in Birmingham in as good a shape! On the 27th September, I went to the pretentiously named Village Hall, Battersea Power Station, to hear Dorian Gerhold talking about the history of industrial Wandsworth. He gave a broad sweeping description of the many major industrial plants and processes that have developed in Battersea, from the first major railway in Britain (horse drawn trucks), Battersea enamels, early aircraft manufacturing and copper smelting techniques to the UK’s busiest railway junction and the Power Station. I say the “pretentiously named Village Hall”, because of course, whatever the Power Station development becomes, it can never really be a village. I have never made any pretence of liking much of what has gone up in the Nine Elms area, but many in the Council’s planning hierarchy, official and political, are very proud of most of the developments. Of course, getting the US Embassy and Apple to move in are major triumphs, which cannot be ignored. So, putting jaundice and prejudice to one side, I ask myself, and some of you, do you see any really valuable and innovative developments? And, even if you do, are those developments worth the unremittingly Alphaville kind of atmosphere of the place? 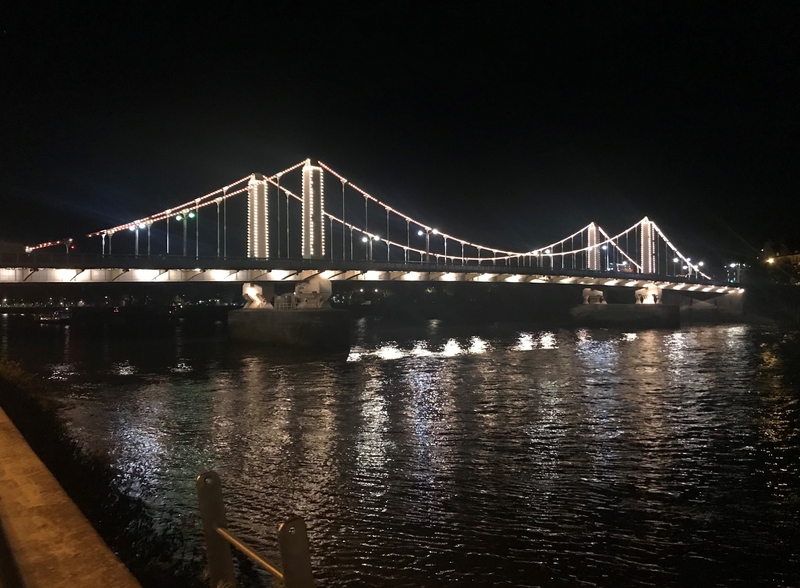 I would be interested in your views – one thing one can say for the development, however, is that it has opened up the riverfront – here is Chelsea Bridge, more or less from the Village. 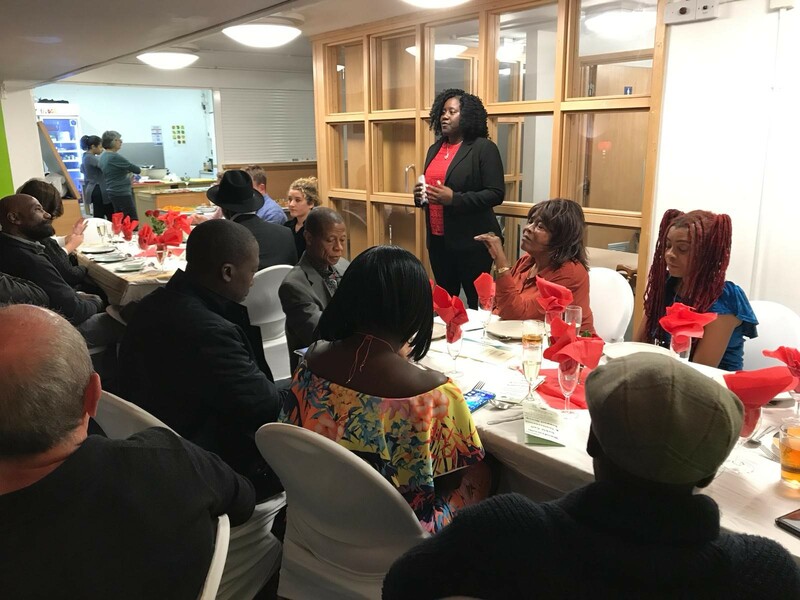 On Saturday, 29th September, I went to a dinner in commemoration of the life of Sally-Ann Ephson, a Labour councillor in Queenstown, who died two years ago after suffering for many months from Sickle Cell Anaemia. The dinner was both a tribute to the brave Sally-Ann and a fund raiser for the Sickle Cell Society, a ferociously painful and merciless condition. The picture is of our guest speaker, Battersea MP, Marsha de Cordova. The first week of October will be dominated by the Tory Party Conference – not something that I would normally highlight but something makes me think that this particular week could be of major significance for all our futures – ho, and just might provide a few laughs! If you follow my newsletters closely then you will know that I accompany my partner to many of her lectures, hence you will not be totally surprised that on 5th October, we are off to Reykjavik, Iceland. That will be a new experience – especially if we are lucky enough to see Aurora Borealis – the Northern Lights! There will be a Council Meeting on the 17th October and the Planning Applications Committee on the 18th. On 20th October a plaque to Caroline Ganley will be unveiled at 5 Thirsk Road at 11 a.m. This is part of Battersea Society’s plan to install as many commemorative plaques to women as we already have to men. Why does Mrs Ganley deserve a plaque? See below. Last month, I asked as an aside whether anyone knew the connection between Lavender Gardens, Henty Close on the Ethelburga Estate and the Cornet of Horse? Two of you did, the connection being one G A Henty, who wrote a phenomenal number of books, 100+, either for children or adventures about the British Empire. He lived in Lavender Gardens and drank at the Cornet of Horse (now named the Four Thieves). Surprisingly enough, Henty Close on the Ethelburga Estate was also named after him. I think that one can imagine the style and values of his books by saying that one of my readers thought her comments wouldn’t get through the censors and the other, remembering books she read at the age of eight, thought they were rattling good yarns! But my main question was about the photograph on the right, which I took in Webbs Road. This got the most enthusiastic response that any of my questions have provoked. What is it about bodily functions that interests the human so much? So, to this month’s question: Caroline Ganley is having a plaque unveiled to her next month. Ganley Court is a fairly unremarkable Council block on the Winstanley Estate, which was named after her. Here she is, on the left, but who was she and why is she worth commemorating? I had building works next-door to me last year and, although I have absolutely no complaints about the standard of works, my garden was unusable in 2017. Thank goodness that last summer was not a scorcher like 2018. Equally, I’ve had friends, who have complained particularly about the 24-hour 7-day a week pumping one often gets with basement extensions. It does seem to me that, as a country, we need to re-consider legislation about both the regulation of standards and nuisance control during construction. Unsurprisingly August has been very quiet in Council terms, so I thought I might indulge myself in a bit of politics – for a change. But first, I did have a couple of visits one from a British student and another from a foreign journalist. It’s a minor pleasure of the job of being a Councillor that people do ring me, from time to time, and ask for interviews about how local government works in this country. The trouble is that, like most people, the more I know the more I realise that I don’t know! To politics and the issue of the EU, about which a number of people have asked me to come clean on my views, and I must stress they are my personal views! Of course, one answer is to say that Brexit or the EU is not an issue for a local councillor and, of course, in one sense that is right. Yet I am not surprised that some of you want to know what the person you voted for only a few months ago, thinks on this massive issue. (If you are not interested on more about Brexit, then skip to paragraph 10). First, I voted in the Referendum to Remain and if we have the chance again, I will do so again. A couple of years ago, I certainly had some pleasure, in discussions with friends, being the Devil’s Advocate and one or two maybe thought I was going to vote Leave. I regret it, if I persuaded anyone to switch their vote, but I rather doubt that I did. However, despite voting “remain” I thought then and still do that the “Remainers” have to face some issues. For example, the EU does not appear to be very democratic – despite the Euro-elections. Perhaps it is impossible to make an organisation with 500+million people feel democratic but either more effort has to be made or the EU should operate through national governments. The present European Parliament does not have much credibility and, I suspect, is not sustainable in its present form. In addition, it does appear as though the Euro currency is and has been a terrible mistake, which somehow the Eurozone has to reform or end as soon as possible. In hindsight, it seems ludicrous to have tied Greece and Southern Italy to the same exchange rate as Bavaria and Brussels; Andalucia and Portugal to the same economic conditions as Berlin and Paris. Clearly, what has worked for Germany has been massively destructive for Greece. Some reforms to the EU are essential and its current settlement should be no more cast in stone than any constitutional arrangement anywhere. But it’s not the Remain argument that exercises me most but rather the Brexit case. I have many objections to the Brexiters’ arguments. For a start it means taking a terrible risk with all our lives and livelihoods on the basis of the assurances that we have had so far, which in essence amount to no more than a promise “That it will be alright on the night”. Especially given that almost every expert believes we will be worse off after Brexit than before. (I know that Michael Gove suggested that we should ignore experts, but in most fields, from brain surgery to plumbing, flying to engineering, I prefer to have experts on my side rather than against). How do you tackle the ecological issues facing the world without supra-national organisations? What possible democratic power do you see standing up to global capitalism and perhaps particularly Californian-based global capitalism? Surely not the UK on its own; just possibly the EU can. In a world dominated by international business, how can workers’ rights and pay levels be protected unless, ultimately, on at least a continental basis? Clearly, there are a thousand problems involved in stopping Brexit but if Brexit is a disaster and bad for Britain then the Labour Party will pay a heavy price, if it hasn’t had the courage to take a stand on the issue. Enough said, but I suspect we will be coming back to this issue before too long. On 3rd August, we went to see Oscar Wilde’s “The Importance of Being Ernest”. You will have noticed that in the last few months, I have been to all the Oscar Wilde plays. In his brilliantly witty way Wilde certainly has a very particular take on gender politics at the turn of the nineteenth and twentieth centuries. But I am afraid that I was disappointed with this production of his most famous play. The text is witty enough without being coated in extra layers of somewhat dubious gender and race politics. I was also asked, along with fellow Councillor Kate Stock, to be part of a panel of judges in a competition being run by the Battersea Summer Project at Providence House Youth Club. The Project does a great job, which is much appreciated by many kids (and no doubt parents) providing sports, hobbies and occupations for the young people of Battersea, but I think this particular competition needs a bit of re-thinking if it is to become a regular event. On 18th-19th August we spent the week-end with Douglas Jay’s widow, Mary, in her beautiful cottage in Oxfordshire. Douglas was Battersea North’s MP from 1946-83. He married Mary, many years his junior, in 1972. We had a delightful dinner with family and old friends exchanging stories about “old Battersea characters”. Unfortunately, but inevitably, Mary is having to move into a more convenient, smaller, urban house. So, this was a kind of nostalgic goodbye to Causeway Cottage, seen here on the right. The next Planning Applications Committee takes place on 22nd August and this time there really is nothing of great significance in Battersea – though I am very conscious that even the most minor application is really, really important to someone or some family. One item worth a mention is an application for the modernisation and re-opening (hopefully) of the Queen’s Arms, seen here on the corner of Robertson and St. Philip’s Streets, just off the Queenstown Road. But I will miss the Committee as on 22nd August I will be carrying the bags for my partner at a Conference in Bordeaux, from where we are going directly to Croatia for a couple of weeks. I have briefed my colleagues on my views on the committee, but inevitably at this time of the year some of us will be missing the evening. There will be the Community Services Committee on 18th September and the Planning Applications Committee on 19th. In recognition of the major traffic and pollution problems facing all the world’s major cities and London in particular, there is going to be a Car-free Day organised through-out the capital on Saturday, 22nd. I cannot imagine that it will result in a wide observance across the whole city but we shall see! The last week of September will be dominated by the Labour Party Conference (and Brexit). Somehow, I cannot imagine that we will reach the end of September without very fundamental shifts beginning to take place in the political landscape! Last month I asked “How many of you know the modern names of these three Battersea pubs: “The Cornet of Horse“, “The Prodigal’s Return” (I said “Son” so thanks to eagle-eyed Chris for that correction) and “The Eagle“? The answer is The Four Thieves in Lavender Gardens, The Draft House on the corner of Battersea Bridge and Westbridge Roads and The Magic Garden, Battersea Park Road, respectively. As a brief aside can I ask whether anyone knows the connection between Lavender Gardens, Henty Close on the Ethelburga Estate and the Cornet of Horse? And as for this month let me ask: I took a photograph of this structure in Webbs Road, at the junction with Honeywell Road. It, is the pole, standing on the pavement and which is slightly higher than the house. Do you know what it is? What it is called? 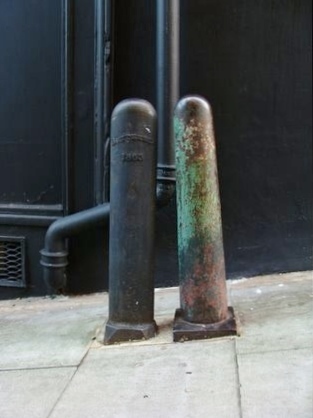 And just how many poles like this can WE find in Battersea? WHAT’S HAPPENING TO COUNCIL TAX? DON’T SWITCH OFF – IT’S IMPORTANT! Why throw money at the Town Halls to resolve the financial crisis? Just who are the real cynics? Getting Thatcher’s children to love the state – or at least trust it! MH17 – A one-off disaster or an inevitable by-product of modern warfare? Great headline in the Guardian today, 30/4/14! “Labour vows to rub out Gove era in education”. The Housing Crisis – Is a massive building programme sufficient to resolve the housing crisis? Faith, Fools’ gold – a modern disaster? Bedroom Tax – and as for the Lib/Dems? Are Wandsworth’s tenancy agreements legal? State Snooper in the Bedroom. A Question of Distribution – Not supply. The Punter is King but now dethroned!